Note: Our current access to internet is very slow, and we’re having trouble with uploading pictures. I think I managed to get some pictures into this post, but I’m not positive. If not, I’ll come back and update again later. Trip Totals: 781.4 total miles(55.8 daily average), 49,635 ft. elevation gain, 11.1 overall average speed. Today was a great day. It was a great day for relaxing and enjoying our surroundings, for slowing down the general “we have to rush to the place we’ll be sleeping” mentality that sneaks into your mind when you’re on a bike tour. There’s a little irony there, because today we actually did have to rush to the place we were going to sleep. 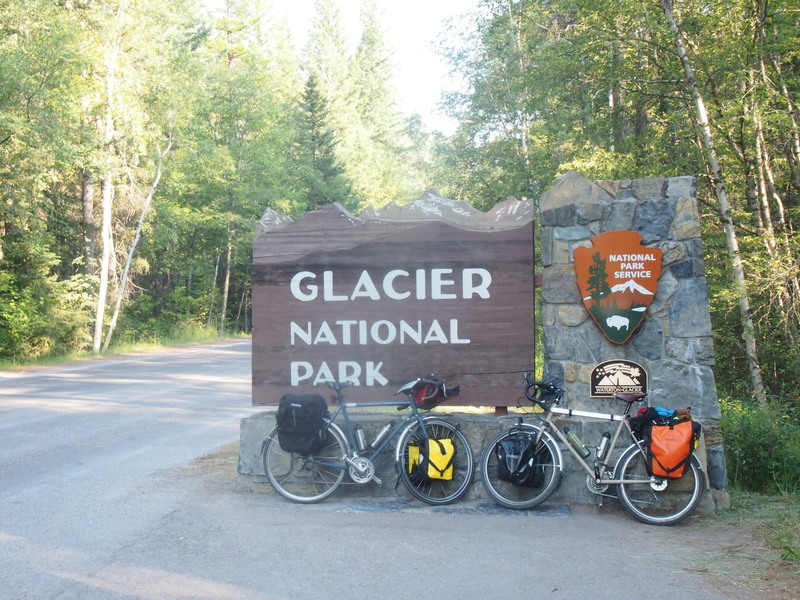 Glacier National Park prohibits cyclists on certain stretches of Going to the Sun Road, the main road through Glacier. We had to ride 35 miles before 11:00a to make it to Sprague Creek Campground in the park, which several people had told us was the best place to camp on the west side of Logan Pass. There were a few hills on the way, and we decided we’d rather have too much time than too little, so we were awake at 5:15a, and on the road at 6:00a. 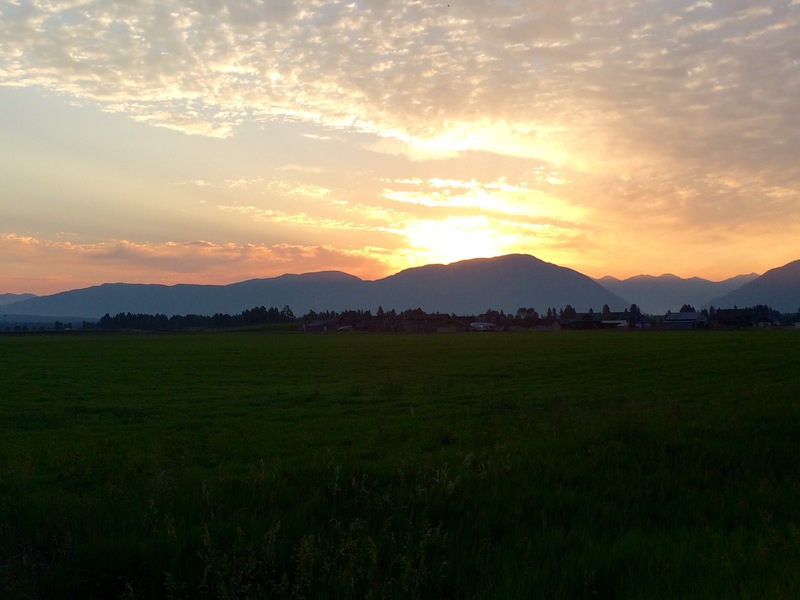 We were a little better informed heading out of the overpriced backyard hostel than we were coming in, so we were able to stay on paved roads heading into and through Columbia Falls. 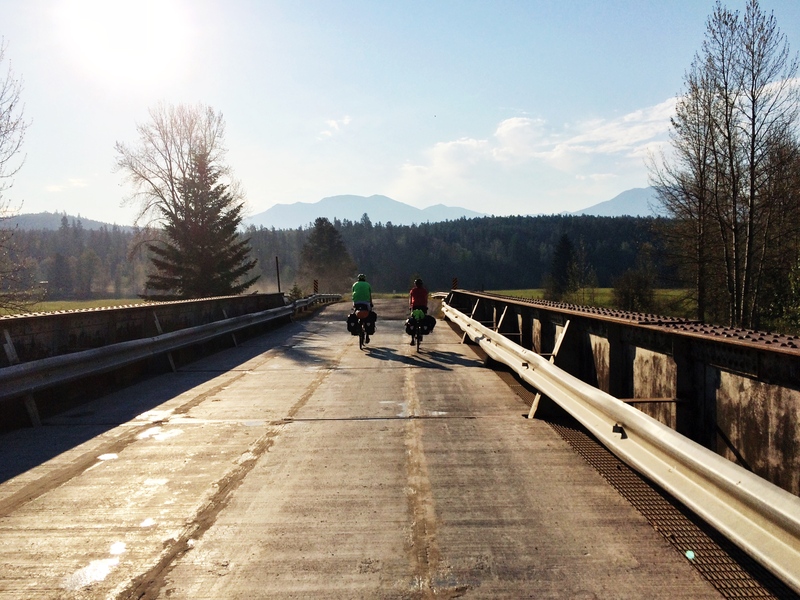 The Northern Tier route took us on back roads, since apparently sections of Route 2 between Columbia Falls and the park are terrifically dangerous for cyclists. The back roads were nice, but we had to fight against a powerful headwind for four or five miles. At that point, we turned off North Fork Road and escaped the headwind, but then we had to ride on a gravel/dirt road again, this time for 2.6 miles. As much as we don’t really enjoy riding on gravel, the experience is reminiscent of our time in Zambia. There we pretty much exclusively rode on gravel, and the best road there was less well-maintained than the worst gravel road we’ve ridden on here. We made it through the gravel and back onto Route 2 for only of a couple of miles before we turned toward the park. We passed through West Glacier, which was a cute-looking town, but we didn’t want to stop because we wanted to get to the campground as soon as we could. The road inside the park was flat and newly paved. It’s amazing how big of a difference a beautifully smooth surface can make. We felt like we were flying! We covered the nine miles between the entrance gate and our campground in a half hour or less, which got us to the campground by 9:15a. That’s right, we were finished riding for the day by 9:15a. How exciting! Dan and Gina arrived shortly after us, and Clive was staying a mile up the road at the historic Lake McDonald Lodge. We set up camp and headed up to the lodge, where we all passed a lovely day doing not much at all. We bought snacks, lemonade, and chocolate milk at the convenience store; sat on a bench behind the lodge and chatted and watched the lake; and ate a buffet lunch, stuffing ourselves with as many calories as possible and making sure we got our money’s worth. After lunch, Clive ran into another British biker tourist named Jules, who, funnily enough, was ALSO touring on a carbon road bike with minimal gear packed into a Carradice saddlebag. Something about these English men, apparently. 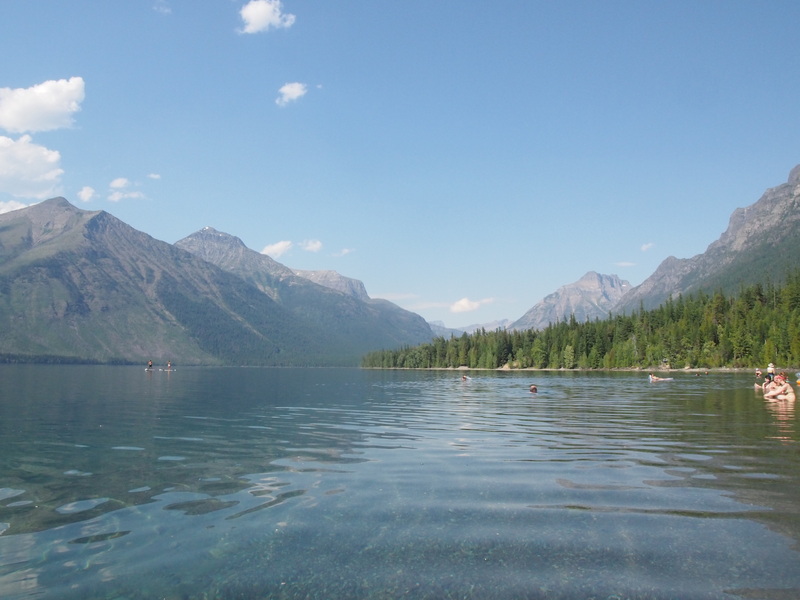 After chatting with Jules for a while, we headed back to our campsite, which, as it turns out, was situated right by a beach on Lake McDonald. 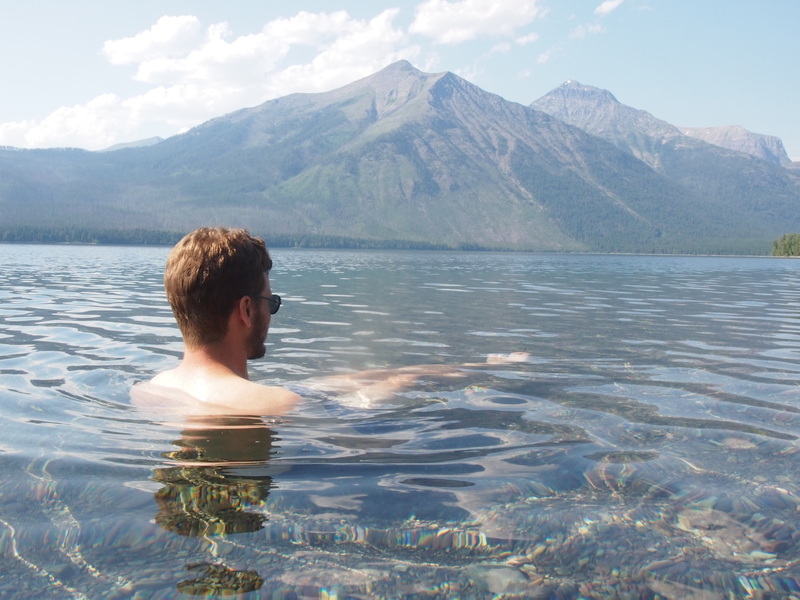 We jumped into our suits and jumped into the lake, alternating between floating on top where the water was warm and diving down into the chilly snowmelt below. When we finished swimming we headed back up to the Lodge, where Clive was kind enough to let us use the shower in his room. As Dani showered, I investigated (for what was at least the third time) a squeaking noise that my rear wheel had been making for a week. It had suddenly gotten worse, evolving from a simple squeak to a shuddering, antilock-brake shaking every time I used my rear brake. I was dismayed to discover that my rear rim was unaccountably bulging right by the valve. I didn’t know what that meant, but I knew it wasn’t good. Dani finished her shower and headed back to the campground and I quickly cleaned myself before throwing myself into Google to try to figure out exactly what was going on. I read that bulges like mine might indicate a cracked rim, and I hurried back to camp to remove my tire to see if this was, in fact, what had happened. Back at the campsite, I found Dani talking to a Dutch couple, Gerry and Klaas, who were biking around Southern Canada and the Northern US and had bike toured extensively in their life. They were a charming older couple, and they were full of good advice from their experience. They also developed an inspirational (at least to us) style of touring that emphasized comfort on the bike and in the campsite. Their tent was like a palace, including a vestibule to store all of their gear, and still folded down to be quite small. We’ll definitely be taking some of their tips on our next trip. Anyways, Dani had our chicken burritos ready when I made it back to camp (what a girl! ), so I didn’t look at my bike until after we ate. I took the wheel off the bike and the tire and tube off the wheel, and my fears were confirmed. My rim had developed a jagged crack at the inside joint of the rim wall and base. This is the first big bike problem of the trip, and the fact that it’s my wheel failing is rather ironic. I have Velocity wheels, which are renowned for their toughness and durability. The rims are wide and the spoke count is high. These wheels should be able to withstand anything. When I went to my local bike shop to measure our spokes so I could get some spares, the mechanic said, “I could sell you some spare spokes if you want, but I would be shocked if you were able to break a spoke on this wheel. This might be the most solid wheel I’ve ever seen.” Several other cyclists we’ve met on our trip have echoed his sentiment. “Boy,” they all said, “You’re really ready for anything with those wheels, huh?” The word “bombproof” has been thrown around a half dozen or more times. I guess I was ready for anything except an inexplicable wheel failure after only 5 years and 6,000 or so miles. Oops. Klaas, who has a significant amount of on-the-road maintenance experience, took a look at my wheel and told me that I should definitely get it replaced, but that I could ride on it until it was convenient to replace it. He opined that it might even last for several hundred additional miles or more. But most importantly, he said that when it failed, it wouldn’t be some sort of catastrophic failure that would send me flying off the bike at high speed, but rather a loss of tension and balance that would break spokes and make it impossible to ride, but not before I had time to realize what was happening and slow down and get off the bike. So that’s that. We’re climbing our last big pass of the trip tomorrow and I’m doing it on a gimpy wheel. I’m not exactly sure what we’re going to do next. We’re a few hundred miles away from the closest bike store, and I don’t know if I willing to gamble that much. I think I’m going to try to call Velocity from the other side of the pass and see what they can do for me. We’ll see!